Looking for a USED HORNET XD? The HORNET XD CNC plasma cutting machine combines strength and superior motion control to create an extremely high performance plasma and/or oxy-fuel cutting machine. The HORNET XD is built for strength. Powerful 480V AC SERVO motors drive a stress-relieved, machined beam along structural I-beam mounted rails. The result is a machine with superior durability and reduced maintenance. The HORNET XD provides superior motion control in its class. The drive system consists of AC SERVO motors, low-backlash planetary gearboxes, and helical rack and pinion. Dual linear ways on the cross-axis provide smooth and precise motion. Retro Systems’ Z-axis lifters use precision ballscrews and magnetic seals for accuracy and durability. Strength, precision motion control, and high-quality components make the HORNET XD the most durable robust CNC plasma machine in its class. That is performance you and your company can depend on. 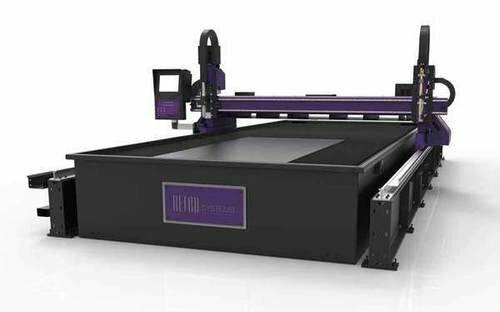 The Hornet XD CNC plasma cutting machine model is available in 5’ (1.5 m), 6.6’ (2 m), 8.2’ (2.5 m) and 10’ (3 m) widths. Lengths of over 100’ (30 m) can be supplied. Looking to Purchase a New HORNET CUTTING SYSTEMS HORNET XD?